Of course, there is a down-side to winter, and that down-side is the cold. Getting out of the shower requires an iron will, and getting out of a warm, cozy bed is a near-impossible task. If you’re anything like me, you’re in a state of constant chill between the months of October to May. And I live in North Carolina, so it’s not like I even have that much to complain about. Remember that rice bag tutorial we shared for body aches and cramps? Well, it also works for keeping you cozy. It’s like a tiny portable heater, and it uses even less energy. Drinking hot drinks can help you stay warm, too. It doesn’t raise your body’s core temperature like you might have been taught (read more here), but holding onto the warm cup will help, and if you think you’re warm, you’ll actually feel warmer. However, you’ll want to avoid alcohol. Hot toddies might make you feel nice, and your skin might even get a warm feeling to it, but alcohol will actually lower your core body temperature. 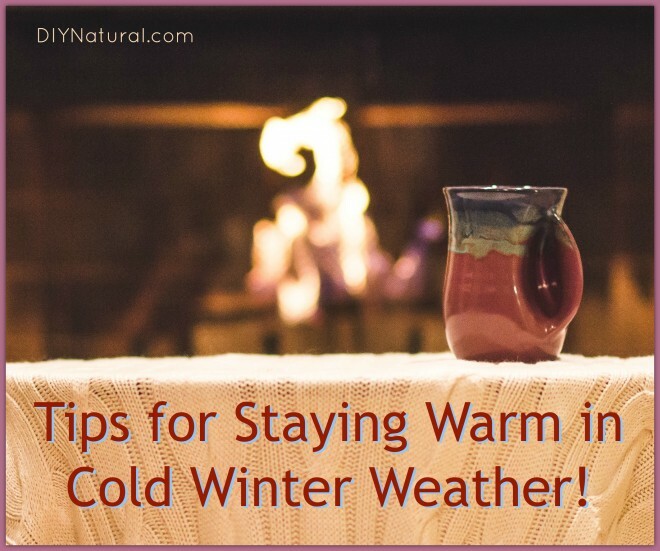 I hope these tips can help knock the chill off of your winter! How do you stay warm when the thermostat drops? Share your best ideas in the comments! Just a little something to add – all of your blood flows thru your neck, so a neck scarf is just the thing to keep you warmer. Cowboys had a bandanna on for many reasons. In the winter, I burn a lot of candles. This adds warmth the room (s), and also saves on the electric bill-thermostat is set lower, and no need for a lot of lights at night!! I am also a frugal person so, I buy candles at yard sales & thrift stores…it’s a win-win situation!! I’ve also made room “heaters” using candles and Terracotta flower pots. I would caution against emphasizing weather-proofing and shrink wrapping your windows, etc. We did both with the intention of saving money on heating bills. It works. It also reduces noise from the street. It also holds in humidity and grows mold. The experts will tell you to buy dehumidifiers. We removed most of the weatherproofing and shrink-wrap. We also bought a dehumidifier to deal with our mold problem. In 2 days of running non-stop, it sucked in 70 pints of water. I don’t like spending money to be frugal only to find out I have to spend more money to fix problems caused by my money-saving efforts. Our grandparents might have wanted “tighter” homes, but maybe their leaky ones, in addition to wearing sweaters, shawls, etc. gave them the best of both worlds: adequate ventilation and tolerable warmth. I guess we just have to get tougher and bundle up. Thanks for the info about the mold/humidity. I do have a dehumidifier, so I’m going to incorporate that into the winter indoor survival kit I have. Overall, though, I do find that if there is heat coming up through the radiators it’s tolerable! Thanks for the advice! That definitely wasn’t my experience, but it’s good to know that it’s something to watch out for. We live in an old croft (stone house) so it takes an age to warm up, we tend to rely on multiple layers to keep warm and if we are sitting on the couch tend to wrap up with a blanket or duvet. Hot water bottles are great too, but not quite as good as cuddling up with one of the children or hubby! I live in New York, and the winters can be brutal. Since I’m in an apartment, I’m often at the ‘mercy’ of when the landlord decides to send up heat (yes, I know – there are heat regulations for apartments, but I’ll share a little story. One morning it was so cold I finally called the landlord to ask for more heat. He insisted my apartment was at 70 degrees since the apartment above me (which has a heat sensor) was a 70. A few minutes later the superintendent showed up, apologetic, with a thermometer. Anyway, the overall temperature in my apartment was barely 58 degrees. The landlord was informed. If I had received an apology from the landlord, I wouldn’t felt better. Last year I had the shrink wrap on the windows (the windows are old, there’s gaps between the wood and glass and I’m afraid a good wind is going to take out the rest of the window.) But – it worked! I did initially have icicles on the INSIDE of the windows (sorry I didn’t take a few photos for proof.) I picked up more shrink wrap to do it again since the weather here is so unpredictable. Thermal underwear, gloves, cozy cardigans are my staples in the cold weather. Of course, I have my old but very reliable hooded parka (it has a removable liner). It’s water and wind resistant – always helpful! I do need a good scarf, though. And hot tea, hot anything (not alcohol) is always a great way to go. So, thanks for the great column – I have to try the rice bag! I’d also love to hear how other apartment-dwellers are dealing.